Charmonique Hopkins has lived at 7405 Desoto in Detroit for the past seven years without incident or problems. The home was new construction seven years ago and is in very good shape. Ms. Hopkins has raised and continues to raise her family in the home; for the past six years she has received rental assistance through the Ferndale Housing Commission (FHC) and the Housing Choice Voucher Program funded by the U.S. Dept. of Housing and Urban Development (HUD). On April 15, 2014 the Ferndale Housing Commission notified Ms. Hopkins that they would do annual inspection on the home to check for any repair issues. Ms. Hopkins waited at her home all day on the 15th, but the inspector never appeared. Then a few days later, the FHC sent Ms. Hopkins a letter saying her home had failed inspection and she would have to move because Ferndale Housing Commission would no longer provide rental assistance to Ms. Hopkins. When Ms. Hopkins contacted the Ferndale Housing Commission to complain that the inspector had never looked at her house and that her house was in good shape without repair issues, they said that an apartment building on the next block to Ms. Hopkins’ home had boards on the windows so Ms. Hopkins’ home failed inspection because of the apartment building on the next block! Ms. Hopkins lives west of Livernois, near Fenkell on Detroit’s west side. It is a neighborhood of about 200 new homes, built in the past seven years, where some older homes and some empty homes stand nearby. Ms. Hopkins has a good home in a good neighborhood, but the Ferndale Housing Commission says she must move after seven years. If the FHC says Ms. Hopkins’ new construction home failed inspection when they didn’t even inspect the home, then the only explanation is that Ferndale Housing Commission doesn’t want tenants and voucher holders to live in Detroit, even if it’s new construction and a stable neighborhood. Ferndale Housing Commission uses our tax dollars to follow an agenda of racism and attacks on the people and the neighborhoods of Detroit. With the people of Detroit under siege on all sides from the politicians, to the emergency manager, to the courts, we cannot allow the racist Ferndale Housing Commission to open yet another round of attacks on the people of Detroit. 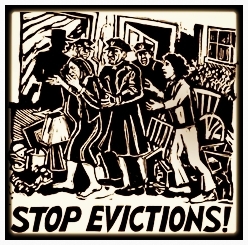 Join us on Wednesday, June 18th, 2014 at 4:00 pm to picket outside the Ferndale Housing Commission Board Meeting at 415 Withington in Ferndale to put them on notice that working people in this area will not allow racist attacks on the people of Detroit by the Ferndale Housing Commission or anyone else. Call the Ferndale Housing Commission at 248-547-9500 to let them know you oppose these racist attacks on Ms. Hopkins, her family and other renters in Detroit. Call the Detroit office the U.S. Department of Housing and Urban Development (HUD) at 313-226-7900 to let HUD know that we will not allow our tax dollars to be used for their racist agenda.